A song penned for Nelson Mandela by Bono, the late Joe Strummer and Dave Stewart will close an HIV/Aids benefit concert on Robben Island, South Africa. Organisers say 84-year-old Mandela will walk onto the stage to the tune of the song, entitled 48864 - the number he wore as a prisoner on the island. The 2 February concert will be held within the walls of the island prison - where Mandela spent 18 of his 27 years as a prisoner of the country's apartheid regime. It is now a World Heritage site. "It's a great way to close, to chant this number and get Nelson Mandela to walk onto the stage and be able to speak to the world about HIV/Aids," said Dave Stewart, one half of the Eurythmics and the concert's music coordinator. Stewart said the song would be on an album of the concert. 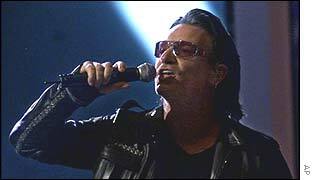 U2's Bono, Shaggy, Queen and Macy Gray are among the concert's star line-up. Other artists confirmed to perform include Nelly Furtado, Jimmy Cliff, Coldplay, Angelique Kidjo, Femi Kuti, Yusuf Islam, Ludacris, Lamya and Deborah Cox. Joe Strummer had been due to appear before his unexpected death on Sunday. His family asked fans who wish to send tributes to send donations to the concert in memory of The Clash star. The concert will be televised globally, with all funds raised going to The Nelson Mandela Foundation, the United Nations' programme Unaids, the High Commissioner for Human Rights and the Robben Island Museum. The event will be beamed up to a simultaneous concert venue at Greenpoint Stadium in Cape Town, which has a capacity of 35,000 people. Tickets will be free and distributed by competitions. Mandela, who admits he still finds it difficult to say the word "condom" in public, has become a leading Aids awareness campaigner since he retired as South Africa's first black president in 1999. At least one in nine South Africans, or about 4.8 million people in a population of 43 million, has the disease or is infected with the HIV virus that causes it. Researchers say up to seven million people could die of Aids-related illness by 2010. Organisers denied that the choice of Robben Island showed a lack of respect for the site as a shrine to the victims of apartheid. "I don't believe at all that the concert is disrespectful of the victims of apartheid," said Ned O'Hanlon, the concert's executive producer. "Quite the contrary, it is a reminder of what apartheid meant to people who suffered through that system. "We are going back to make that connection."